Zelda may be the wise, strong leader of Hyrule, but to really get anything done, she'll have to start dressing like a man. There is certain symmetry to this transformation. If, according to the game's own logic, to be female is to be a captive, then to rid oneself of one's femininity is to be liberated. Existing in the subliminal space between conventional notions of male and female, Sheik is freed from the constraints of either. The result is an inversion of the usual order of videogames: While Link incubates, he is passive, inert - a prisoner. Meanwhile, Zelda-as-Sheik is free to wage a covert war against the forces of evil. 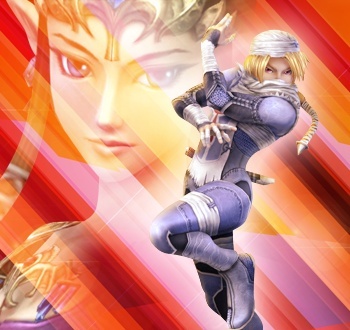 During this time, it is Sheik, not Link, who is the hero of the tale. I always did struggle with Zelda's innate inactivity. Sure, rescuing the princess is part of the formula, but Zelda never struck me as the kind of gal who was content to sit around and wait for others to solve her problems for her. Then again, maybe I'm reading far too much into games that let you kick chickens. Read the rest of Dude Looks Like a Lady and share your thoughts on the Zelda/Sheik/Link issue.